I just got engaged. I am really excited, but I want a destination or beach wedding and I don’t know where to begin. How do I do this right and with the least amount stress? and within budget? This is The Beach Wedding show number 8. We have beat the odds! Show number 8. The top ten most popular dates include major holidays such as Christmas Eve, Christmas Day, New Years’ Day, and Valentine’s Day. We sponsor a free engagement photo along with our demo day in March. Click here for more information about our 2018 event. More info coming soon about our 2019 event! So in the get to know us section, we can do up to three simultaneous beach weddings and two receptions per day. When you contact us about your wedding, talk about how busy we are for your date. See if we are available. How long should should I be engaged before I get married? Work on a realistic Budget for the entire event. If you are heaving a reception, work with the planner to secure a VENUE this first. The beach wedding is the easy part. 1) How long should should I be engaged before I get married? 33% of couples are engaged for over 16 months. Also if you are paying for all of your expenses and cost yourselves, you may need a fixed period of time to save for the cost of your beach and destination wedding & reception. Make sure you hire a highly rated wedding planner as you start your planning process as they are your boot son the ground at the beach or destination wedding. What is a good time of year for you and your guests to travel or go to a beach wedding? Have planner tell you about peak seasons, room rates, local large scale events which can affect these. If flying, look at airfare rates for your projected trip dates. We have planned full destination weddings and receptions in as little as 30 days. But this varies based on size of wedding, reception venues, vendor availability, time of year etc. Also have an alternate date “just in case” your special date will just not work for your planning needs. A good planner will give you options and the challenges in looking at your special date. If you do not have a specific “special” date in mind, pick 2-3 dates that would work in theory so you r planner can assist you with find a date that works for everything including venue, vendors, lodging, etc. If you are flexible, and you are considering a destination beach wedding, look at dates during the weekdays! Venues will be more readily available, sometimes less expensive. The beach is less busy. Restaurants are less busy! Discuss backup plans for your date in the event of weather that is unrelenting. A backup plan may be the next day! Are you planning a reception after the beach wedding? If so the number of guests will dictate the choice of venues that can accommodate certain group sizes. If you are planning a reception at a hall or banquet room (non-restaurant) this will take more planning time, not only to secure the venue but the decor, vendors like catering, DJs, cakes etc will be added to the planners tasks. For smaller sized weddings, restaurant receptions are often a smart and even economical choice. But planning time matters with these locations as well. 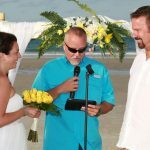 Receptions on the beach are also an option, but are much better between Nov 1st and April 30th due to weather, peak season, and environmental issues like turtle nesting season. These are easy to plan as there will always be room on the beach! But there are many pros/cons to beach receptions. 4) Work on a realistic Budget for the entire event. Actually plan two budget numbers, your absolute maximum and the desired budget. Provide your planner with the desired budget number so that can work backwards and give you the best options for your money. This way if you have any overages, it should still fit within your maximum budget. Here are some reviews about planning a wedding from afar! I’m so appreciative & filled with so much joy that Steve & his beautiful Wife made our day perfect, after the paradise cruise line cancelled on us 30 days prior to our date, due to fema sending their only ship to the Virgin Islands. I was then referred to Steve & I wouldn’t change anything if I could do it again, it was perfect, thanks so much. Tommy & Tyesha Green. 6) If you are heaving a reception, work with the planner to secure a VENUE this first. The beach wedding is the easy part. While this has been mentioned before, it can not be stressed enough. Venues get booked up for popular dates and Saturdays, so let the planner have enough time to provide you with venue choices that will fit your budget. Consider all options, hotel banquet rooms, civic centers, private venues, restaurant and beach receptions. Ash the planner to send you photos of the venues with receptions so you can get a image before you commit. Ideally, an early planning trip where you can tour reception venues with your planner would be bonus, but a good planner will take out some of the worry if you can not make this trip. Many people choose destination weddings as a way to have a more private and less expensive wedding & reception, than doing a large wedding in your hometown. If this is you, you will manage your guest list to a number of people that you “really” want to attend, know that some simply can not or will not make the trip and incur the travel costs. Get ready to make tough decisions with your fiance to pare down the initial list of potential attendees. Go through the list and scrutinize each guest 2-3 times together. Your planner is the go to group to help find great vendors that are available for your date and in your budget! Let them do the heavy lifting. For us, Beach Weddings are the easy part. We have turned them around in 48 hours! We own all of our inventory and have 47 miles of beach in Volusia County alone! Vendors like catering, #1 are critical as they may only do one event that day. Same with DJ’s, bands, Photographers and Videographers. Cake/bakery have the ability to serve more clients on your day, but deliveries become important. Don’t forget to PLAN YOUR TRAVEL & lodging as early as possible! Your planner can assist with lodging including blocks of hotel room, condos, home rentals etc. Pick a couple of dates, even if your heart is set on one special date that it must be. If you are having a reception, add extra time to your planning period, and always secure your venue first! Make a guest list and read up on managing a destination wedding guest list. Link in show notes.